Chelsea defender Antonio Rudiger was shown in a heated exchange with one or more travelling Blues fans at the end of yesterday’s 6-0 defeat to Manchester City. The Blues put in a dire display to suffer their worst ever defeat in the Premier League era, with Sergio Aguero, Raheem Sterling and co. on fire at the Etihad Stadium. Rudiger at least showed he cared by going over to the fans and getting involved in what looked a heated but frank and honest exchange. 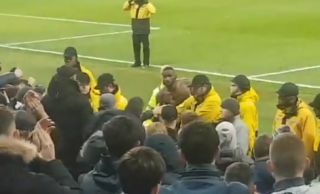 It’s not clear precisely what’s being said, but fair play to Rudiger for being prepared to face the away supporters are such a humiliating result.